French ranges a timeless piece of luxury that adds a dose of elegance to any kitchen. I’ve often seen these beautiful French oven and stovetops on Instagram and Pinterest, but never knew why people chose them. I decided to do some digging to see if a French range should be on my kitchen wishlist. 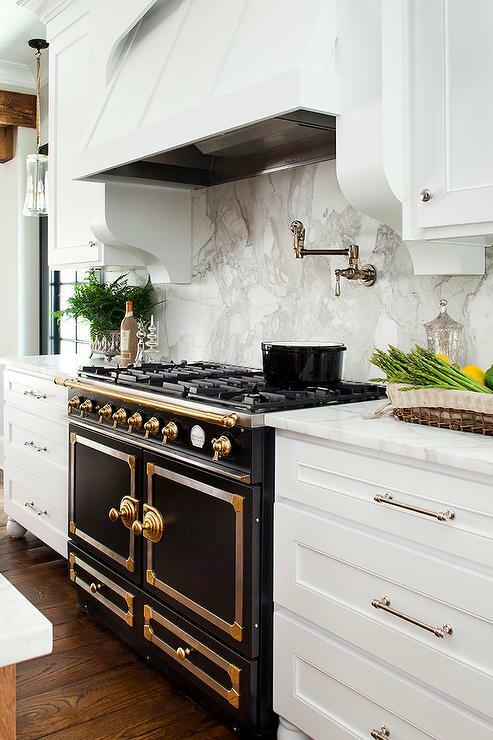 French ranges are often associated with professional quality “chef’s ranges.” Their designs are often reminiscent of vintage stove from old European homes. In essence, French ranges are supposed to be the epitome of form and function. This article will focus on the top two French range makers: Lacanche and La Cornue. Knowing what your needs are as a cook are extremely important. You should also have the specs of your kitchen countertops on hand to make decisions without delay. Delivery could take up to 6 months. Plan accordingly. Inquire with each company to determine if they have approved installation and repair companies available in your area. If they don’t, you might want to consider a US-made range. Gas vs. Electric: These ranges are usually powered by both gas & electricity. The ovens are powered by either electricity or gas and the stove top is powered using gas. Hardware finishes typically are offered in a gold / brass or chrome / silver. Cleaning: Can you remove the sides of the oven in order to easily clean them? Color: Colors are typically considered an upgrade, and thus can incur additional fees. The good thing is that these ranges are offered in a cornucopia of color choices like soft ivory, pitch black, baby blue, mint green, blush pink, and rich Bordeaux red. Installation Costs: Depending on your location, there may or not be an approved installer in your area. It’s a good idea to speak with your contractor or renovation team to see if someone has experience installing this type of range. La Cornue is one of the most popular brands for French ranges in the United States. It is the first French range I noticed for its distinct design. It quickly becomes the centerpiece of the kitchen when it is installed and commands attention. Keep this in mind as you go about designing your kitchen around the La Cornue range. La Cornue was founded in 1908 by Parisian herbalist and perfumer Albert Dupuy. In Paris, Dupoy developed and launched the world’s first convection oven. In those days, most ovens were hollow iron boxes that suspended racks over a fire. It reflected the attitude of the time: when most people used an oven to simply heat up their food. Dupuy was one of the first people to think about cooking as more than just a way to heat food. His proprietary method involved using a vaulted ceiling within the oven to circulate heated air around the food. He employed the city’s gas lines to power his creation, many of which had already been routed to people’s homes. While it remained a small family owned business for over 100 years, in 2015 La Cornue was purchased by the American residential cooking and industrial equipment company, Middleby Corporation. How much does a La Cornue range cost? La Cornue prices range from $8,475 to $56,000+ depending on the configuration you choose. La Cornue offers three main ranges: the Château, CornuFé and CornuChef. The CornuFé is the most popular model in the US. The oven offers seven settings: thaw & serve, convection, convection broiling, convection assist, conventional oven, browning, and warming. The oven provides in-oven racks and trays to ensure a perfect fit when baking or cooking. They slide into place with some grooves along the wall, just like a shelf. The two separate ovens allow for multiple dishes to be cooking at the same time: for example, a turkey can cook in one oven while a side dish cooks in another. The oven is not very deep, but is quite tall. Currently the easiest way to purchase a La Cornue range is via Williams Sonoma. La Cornue is the only brand of stove that Williams Sonoma currently carries. You can also purchase a range from La Cornue directly. 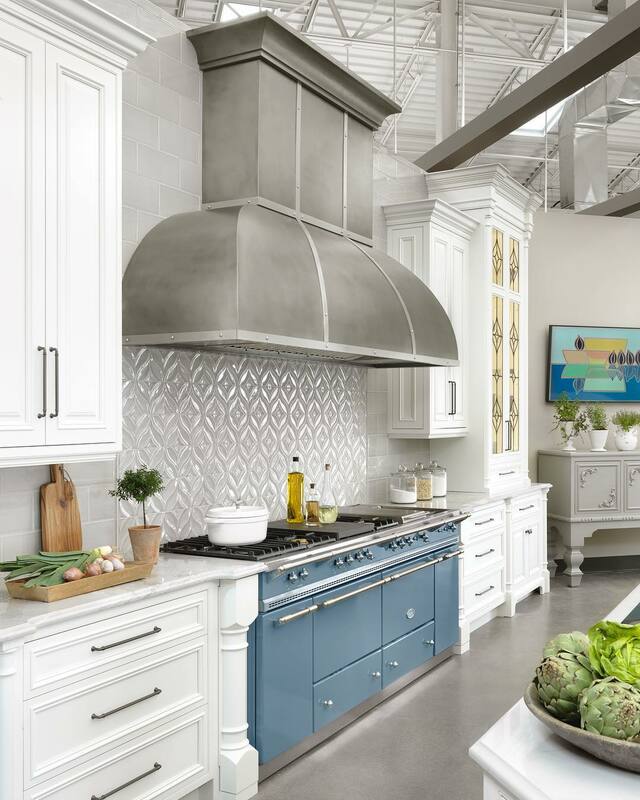 La Cornue has even launched a line of cabinets to match their popular ranges – designed in the same aesthetic as their ovens, in case you wish to build out your kitchen to match the lovely design. Lacanche is the main competitor to La Cornue. The main reason why I see consumers choose Lacanche oven La Cornue is due to its minimal design. La Cornue ranges have thick strips of metal and large knobs which quickly make them the focus of your kitchen. Lacanche ranges have smaller parts and a clean façade, making it easier to blend into your kitchen. Lacanche is named after the small Burgundy village in France. Ranges, ovens and other cooking equipment has been produced since the 19th century. Craftsmanship in metal is at the forefront of the Lacanche brand. Lacanche notes that some of the first wood and cooking stoves they produced for homes across France were the first of their type built in the country. From chefs to home cooks, Lacanche crafts each of their ranges according to their specific order: from various models, options and finishes. In recognition of their expertise, Lacanche has been awarded a heritage honor by the French government’s Economy and Industry Ministry – demonstrating their national renown in manufacturing excellence. Lacanche offers a “Classic” line and a “Modern” line. As the names would imply, the Classic line offer a vintage look and rustic appeal, while the “Modern” line is well, modernized in appearance. At first glance, it appears the Modern line has a long block of stainless steel behind the knobs. Each of the 12 models is offered in the “Classic” version or the “Modern version: Cormatin, Rully, Beaune, Bussy, Cluny, Chagny, Volnay, Vougeot, Chambertin, Chassagne, Savigny, and Saulieu. The models range from 27 9/16″ to 43 ½”. Lacanche sells three oven types: Electric, Electric Fan Convection, and Gas (you can choose between propane or natural gas). Gas cooking keeps the air moist allowing the flavors to blend, and meats to cook well without drying. Electric ovens result in dry heat and are best for baking and pastries. For this reason, many consumers opt for one gas oven and one electric oven. 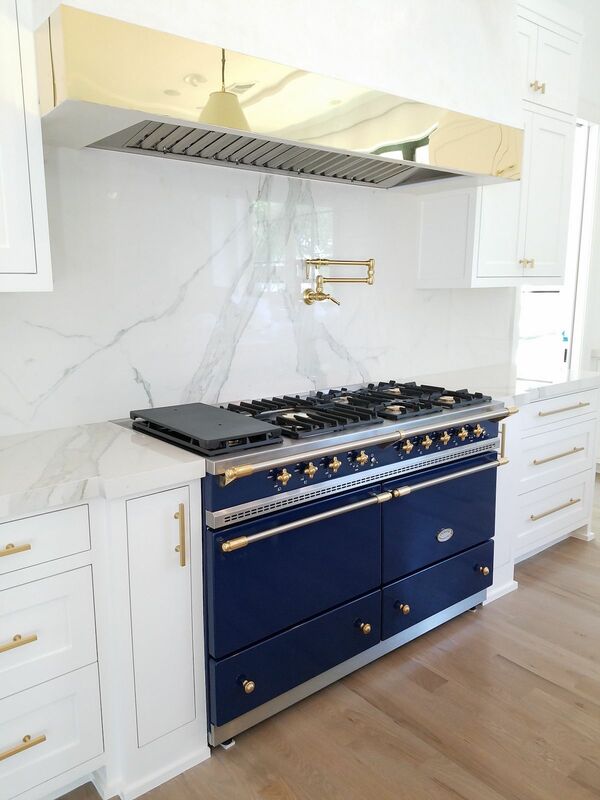 When it comes to the cooktops or burners, gas has been the preferred method of heating by both professionals and stay at home moms for as long as I can remember! Gas allows you to control the heat precisely. Lacanche burners are created using two removable parts: the base of the burner is aluminum, while the burner cap is made of brass. You can remove both in order to clean them. Are French Ranges Worth it? Honestly, I’m undecided here. I’ve read a few too many reviews of these ranges being shown to cook unevenly or take multiple attempts to light a burner on the stovetop. It seems to me at this price, the ranges should work flawlessly and there should be nothing by glowing reviews of them! That being said, there is no question about the physical appearance of these ranges. Many people describe them as the most beautiful range they’ve laid eyes on. Instagram can certainly confirm that they are aesthetically pleasing. All in all, I think the lack of support for US-based consumers and the dismal reviews of the functionality are hard to ignore. If you have the budget to keep up with potentially expensive maintenance and you love the look of the range, then I’d say go for it!